I’m delighted to be confirmed for a panel at the 2015 YA Lit Con, which is part of the London Film and Comic Con. What are the differences between writing for the page or the screen? Find out in this session bringing together co-creator of Robot Overlords Mark Stay with the team behind Gemini Force One, MG Harris and Jamie Anderson. Mark Stay will be talking about his experiences of writing both film script and novelisation for Robot Overlords, and sharing some behind the scenes insights; whilst MG Harris and Jamie Anderson will discuss how they collaborated on their new series, originally devised and developed by Thunderbirds creator Gerry Anderson before his death. This should be great fun. The Gemini Force project is hugely exciting (especially if you’re a Gerry Anderson fan! ), and YALC will be hosting panels with the best names in YA lit, including Charlie Higson, Malorie Blackman and Patrick Ness, so you’re guaranteed to have a great day! This should be great fun. The Gemini Force project is hugely exciting (especially if you’re a Gerry Anderson fan! 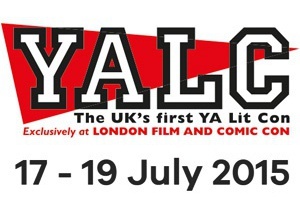 ), and over the whole weekend YALC will be hosting panels with the best names in YA lit, including Charlie Higson, Malorie Blackman, Joe Abercrombie and Patrick Ness, so you’re guaranteed to have a great time!